A device similar to the one that the famed physicist Stephen Hawking uses to communicate is being developed for people with disabilities in China that will allow users to operate a computer using just their eyes. 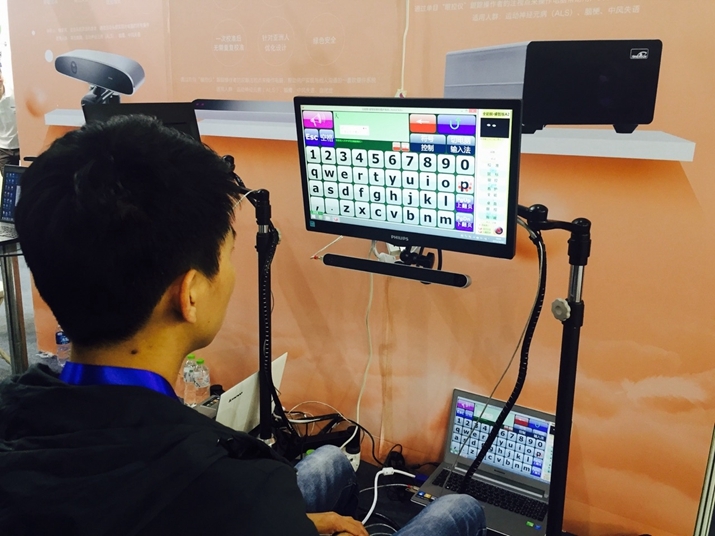 Users of one computer from the Beijing 7Invensun Science and Technology Co. Ltd. can type by moving their eyes to the keys of a keyboard shown on a screen. The company gave a live demonstration of the machine at the ASEM (Asia-Europe Meeting) High-Level Meeting on Disability and Global Conference on Assistive Devices and Technology in Beijing on October 29-31. The user was able to type out the Chinese character nihao, meaning hello, in just 10 seconds. "Of course it's slower than typing with your fingers, but it's better than nothing for people with finger disabilities or who have amyptrophic lateral sclerosis (ALS)," a demonstrator from 7Invensun said. "After practicing it for some time, it can be a lot quicker than this." China has about 200,000 people suffering from ALS, which increasingly weakens the patients' muscles until they become rigid. Eventually, their speech, swallowing ability and even breathing become complicated. Devices like the computer developed by 7Invensun could be a game changer for technology and the way that people with disabilities live in China. During the ASEM High-Level Meeting on Disability and Global Conference on Assistive Devices and Technology, the China Disabled Persons' Federation (CDPF) made an initiative to promote the development of global assistive devices and technology industries on October 29. It said that assistive products (devices or instruments), which are designed for persons with disabilities, elders and persons with sickness or injuries by eliminating barriers and improving their quality of life, can help people regain their self-dignity and integrate into society. "We recognized that these small assistive devices promise a big industry, which embraces diverse economic categories ranging from manufacturing to the service sector with a huge market potential for economic growth, which can advance human civilization and social welfare. We underscored that everyone, in his or her lifetime, might use assistive devices temporarily or permanently," the CDPF said in the initiative. "Life is super difficult for people with disabilities," said Gao Yong, who was visiting the exhibition from Xi'an, northwest China's Shaanxi Province. "While we enjoy the smart life that new technology has created, they always have this or that limiting them from the same experiences." Gao said that he hopes his call can be heard by the high-profile attendees at the event, including officials in charge of disability issues from ASEM members, representatives of international organizations including the World Health Organization, International Telecommunication Union and Rehabilitation International, delegates from disability organizations, entrepreneurs and experts. 7Invensun developed the eye-control computer and first demonstrated it in 2009. "We've used the keyboard and mouse for years. It's time to make a revolution," said Huang Tongbing, 7Invensun founder. He thinks the device is a potential breakthrough in wireless technology, an idea that is partially showcased in the company's motto: "Let the world understand your eyes." When the company was first developing the computer system, its programmers tried it on people diagnosed with ALS, the same disease that afflicts Hawking. Wang Jia, who was diagnosed with the disease at the age of 24 in 2007, used the computer to write his book There Are No What-ifs in Life . "The integration of new technologies with devices for persons with disabilities is a trend," said Peng Fan, Operation Director of 7Invensun. "For example, the eye-control technology that we developed can be used for ALS devices and can also be applied in people's daily life. This is the prime age for assistive devices like this." 7Invensum isn't the only company looking to break new ground. Aooman Happy and Health Technology Co. Ltd., a Tianjin-based company, is focusing on developing multimedia interaction facilities. Founded by a group of leading teachers and professors from the China Central Academy of Fine Arts, Aooman is creating devices to assist children with special needs. The team first got the idea after a visit to the Rehabilitation Center for Disabled Persons in northeast China's Liaoning Province in 2010 and seeing up close what challenges children with special needs face. They found that traditional training methods and devices weren't effective, with many of these children refusing to even try them. "Even though the teachers at the rehabilitation center are quite professional, the children could only draw by hand or make some designs using outdated computers," said Li Huan, Aooman's General Manager. After three months, the Aooman team went back to the rehabilitation center with their newly developed multimedia device. The silver-colored gadget looks more like a box, but as long as a person touches it, his or her body will become a musical instrument. When a child touches different parts of the "instrument"--fingers, ears, nose or even hair--it will emit different musical notes. It is like turning a person into a piano. The contraption was a resounding success. Both the kids at the rehabilitation center and the teachers were crazy about it, Li said. "As the market for devices for children with special needs wasn't developed before, the choices for such devices were quite limited," said a teacher surnamed Zhang, who works at the rehabilitation center. "With such devices, children with infantile autism are more willing to interact with other people." Aooman's devices have been adopted in more than 20 schools for children with special needs around China. Meng Chongfang from Shenyang, Liaoning, had her left leg amputated five years ago due to osteocarcinoma, or bone cancer, and got an artificial leg after the operation. "It cost me about 40,000 yuan ($6,260) and it's expensive, but even this is very basic," Meng said. "The artificial legs with which you can run and jump like a normal person are priced at more than 300,000 yuan ($46,950). It is a big expense and hard to afford as persons with disabilities are typically not that wealthy." Today, new 3D printing technology is helping to alleviate the problem. On May 28, a 6-year-old boy in Xinyang, central China's Henan Province, got an artificial arm that was printed using a 3D printer developed by Wuhan Union Hospital. Now, the boy can use the arm to hold a cup and can even ride a bicycle. The arm cost just 600 yuan ($94), significantly less than its traditional counterparts. "Even though this technology is still in its initial stage, and the products don't look quite elegant enough, the future is super promising," said Xu Guisheng, a doctor from Guangdong Province. "Lower costs raise the possibility of mass production using this technology."